During the last month I participated in some blog hops at RubberNecker Stamps and Our Daily Bread Designs and was thrilled to be a winner at each. Over the weekend I played with my new 'Morning Glory Frame' from RubberNecker......I really liked this stamp when I was visiting their blog hop and did a little happy dance when I realized I could order it after winning!! My original plan called for another stamp inside the frame I created, but then I received the new Scripture 7 set from Our Daily Bread and wanted to use this stamp instead for the ODBD Blog challenge to incorporate a frame in a design. I did a great big Happy Dance the day I won this and wonder if I haven't used up my luck for the year, maybe I should have bought a lottery ticket last week when that BIG money was up for grabs - LOL. Just had to bling this up a bit with some of the new shiny's I bought at Michael's.....since pink is a favorite color of mine I am liking this card. This frame will be used a lot these next few weeks with my new Scripture set and some others I ordered from ODBD as I start making card sets to use as gifts. I had hoped to do more than one challenge this week but then I start playing and get so into what I am doing the week just flies by.....maybe next week!! Supplies used were, RubberNecker Morning Glory Frame, Our Daily Bread Designs Scripture 7, CS, Embossing powder, Oval Nestabilities to cut frame and foam square to mount and layer. Recollections Rhinestones. Needed a card for a friend and was inspired by the spring like weather we have experienced the last three days. This past weekend I finished the Copic Certification class here in St. Louis and have been wanting to play with my copics ever since! As I travel the blog world I have been smitten with Magnolia stamps and recently found a store that sells them....I really had to control myself and not go crazy (trust me I showed great restraint). This little bunny was one of my purchases, I think he is just adorable. I kept the coloring pretty simple on these images.....one thing I realize is just how many more copics I need (LOL - want) so I can get more depth.......placing an order right after I post this. Decided to be brave and enter this in the Magnolia-licious Challenge - this isn't quite on par with the great work I view there but I decided to get my feet wet, so to speak, and jump in with those big girls. They give me something to aspire to. Supplies used: Radiance smooth CS, Memento black ink, Magnolia stamps. Copics: lets just say a bunch. Have had this digital stamp from Mo's Digital Pencil for a while and wanted to make a 'girlie' card. She is soooo adorable. When my kids were young a group of us would get together every Friday - one of the kids favorite things to do was pull out the 'dress up' box and go to town putting things on....even my son got into it with capes and fun hats. Couldn't help but think of this when I was coloring little Ruby here. I used my prismacolor pencils and gamsol. The sentiment is from my computer. I am going to enter her in the Stampin Sisters In Christ Challenge this week. Supplies: Ruby from Mo's Digital Pencil, Nestabilities, DP and vellum, Pearls from Michaels, Prismacolor pencils, gamsol. Woke up this morning to some very unexpected snow - three inches of white slushy stuff!! Just the excuse I needed to play in my stamp room - LOL - maybe we should run a poll on 101 reasons to play with our stamps I would love to hear what everyone has to say on that subject. This little doggie is a digital from Meijens Designs. I just fell in love with this digital since it can be pink for a little Cowgirl Doggie or blue for a little Cowboy Doggie. Always looking for an excuse to play with my Copics and couldn't wait to get them out today....as always it was fun. Each time I use them I learn more and more and wonder what took me so long to try them. I really like how the background behind this puppy turned out - I ran my EF through my CB with some TH Distress Ink and I really think it has a nice aged look to it. Now its time to do some good old housework (ugh) - then I can come back and play some more!! Used my Sizzix letter die and my Spellbinders for the frame (ran two together through the Cuttlebug to obtain this look). The background for the doggie is some beige paper run thr my Cuttlebug with the Paisley EF that I dabbed with Tim Holtz Pumice Stone for an aged look. 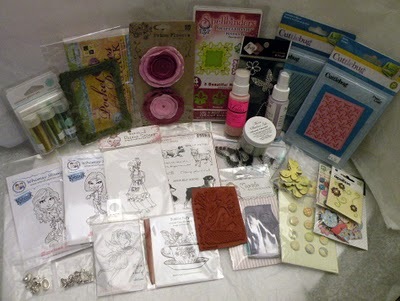 Some fabulous blog candy available at Angelwood's Crafting Corner. Had an awesome visit there today to view a young artist in the making!! Be sure and visit. Wow - what a crazy week! The weather has been all over the place, but in general on the cool side. The sun has peeked out very little and rain seems to be the norm.....yuck! I think I am in definite need of some vitamin D. This may explain the bright colors on my cards this week :) As I began to play with my copics, creating some pretty little springy flowers, it seemed that only vibrant backgrounds called out to me - seriously I fought this urge as it took me way out of my usual comfort zone, but I followed the call and created some pretty intensely colored cards! WARNING - you may wish to put some sunglasses on before viewing, and please note the creator of these cards is not responsible for your eyes being overwhelmed by the brightness - LOL!! Materials used: CS, DP, Sizzix die, Nestabilities, Cuttlebug EF, Stamp by Stampa Rosa, Copic Markers YG17, G14, R43, RV10, YR15, Y13, Y15, Y17, Y38. Ribbon and embellishments. Button, Button, whose got the button??? All week I have wanted to get a card ready to enter in the Stampin' Sisters in Christ and Our Daily Bread Designs Challenges. Wow I have almost let the week slip by me. 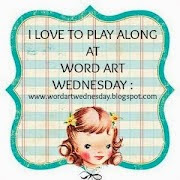 Tuesday I worked and Wednesday I went shopping at a new stamp/scrapbooking place with my friend Pat....its so nice to have someone who shares the same enthusiasm I do for this craft and is willing to drive miles to look at paper and stamps with me. While we were shopping I was sooooo excited to find some Magnolia stamps and new funky ribbon - as I told Pat even if I don't use this ribbon I'll enjoy looking at it and thinking of things to do with it - and surprise, surprise it is exactly what I wanted when I finally put my card together. The challenge at SSC required buttons so I knew I would be including some in my design. I don't often purchase buttons because when I go to use them they are never quite the color I want. Blog hopping last month I discovered an exquisite card by Angella Crockett at Body, Mind and Spirit, Stamps - her buttons actually matched her design paper because she makes her own. This lovely lady also had a tutorial on her blog showing the process step by step.....so I jumped right in and made some, and today I am using them on my card. Posted below is a close up of these cute little homemade buttons. This is the second time I have made my own buttons and what fun it is to use different shapes - even changing the ribbon or thread tied through them can change their appearance......Thank you Angella for taking the time to share your creative talent thru a tutorial. There is so much to learn from so many of you - thank you for sharing your ideas and talent!! Products used were DP, ribbon, die cut, bling, punches, crystal effects, ODBD sentiment stamp, and angel stamps from Michaels. My angel image was inked up with Stampin' Ups Rose Red and I stamped her on a scrap sheet first to mute the color under my sentiment.